Kendriya Vidyalaya Sangathan (KVS) an Autonomous Organisation under the Ministry of Human Resource Development, Government of India invites Online Applications from Indian Citizens for filling up the vacancies of Principal, Vice Principal, PGTs, TGTs, Librarian and PRTs in Kendriya Vidyalayas. How to Apply for kvs recruitment 2018 ? 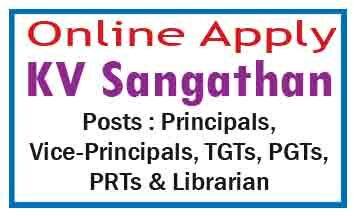 Candidates are required to apply online through KVS website www,kvsangathan.nic.in. No other means/mode of submission of applications will be accepted. The recruitment test will be conducted through Offline Mode.